With the fall TV season just about to explode, I decided it was the right time to talk about an App that not only looks amazing but also has an insane amount of features. 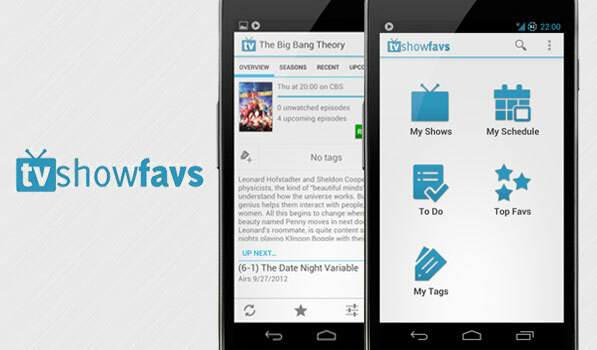 I got to know about TV Show Favs only a few weeks ago and it is one of the best apps on Android right now. Everyone is really busy and it is pretty difficult to keep track of your favourite TV shows. TV Show Favs will change that for you. The app has a relatively limited feature set in the free version and the default theme isn’t anything to write home about. The paid premium version of the app is really great. The app has 2 themes available. I have been a fan of apps that have Holo Light themes because I can’t stand that black gradient background in dark themes. You are prompted to create an account when you launch the app and you then proceed to the main page that has an icon grid with the 5 main sections of the app. You can add shows by clicking the magnifying the glass on the top right of the screen and searching for shows. Tapping the star next to the name of the show will add it to the ‘My Shows’ section. The app also has some brilliant alert settings for TV shows. It is one of the few apps that supports Jelly Bean’s rich notification format and you can go straight to the episode or show right from the notification. The app has some great typography and barring a few minor complaints, it is one of the best TV show tracking apps on any platform. The ‘My Schedule’ section presents you with a nice calendar view with events setup for each episode. I cannot emphasize how much of a disappointment the default theme is compared to the 2 themes available as in app purchases or in the premium version of the app. The To Do section is really neat as well. It has progress bars for each show and shows you how much you have left to watch. The ‘Top Favs’ section has TV show charts. The app doesn’t end there. There are some really great widgets as well. The stack widget in particular is my favourite and it has a nice interactive layout with TV shows stacked as posters with information about upcoming episodes written on the bottom of each poster. There are other widgets as well like a nice scrollable one that has a table view with episodes as cells. With the Nexus 7 gaining popularity, there is still a massive dearth of apps that look good on it. Most are just phone UIs stretched with buttons too small or apps that just aren’t compatible with it. TV Show Favs looks amazing on my Nexus 7 and the developers understand how to design for phones as well as tablets. The free app has many limitations and ads. There are in app purchases that unlock notifications, social integration (Get glue), Trakt integration, removal of ads and two themes that got the app featured here. Each of these cost $1 separately but I urge you to get the Premium Key that unlocks everything listed above and all future features added. The Premium Key is a $5 in app purchase available from the preferences page. The app is available for free on the play store. Note : There is a premium key available on the Play Store but that is only for users of the previous version of the app. New users are instructed to purchase everything from within the app via in app purchases.